Lomond: The Wholesale Food Co has launched ‘Nom Stop’, an all-in-one food-to-go ‘turnkey’ solution. For retailers, the Nom Stop setup includes kitchen equipment, marketing material, branding, a step-by-step guide with crib sheets as well as all the legal and food safety requirements, menu display screen, signage and shop fitting. “We take care of everything from the set-up to the food being sold, which makes us a genuine one-stop shop,” said Lomond boss Sam Henderson. “We will also provide ongoing support from our creative, technical and sales teams. 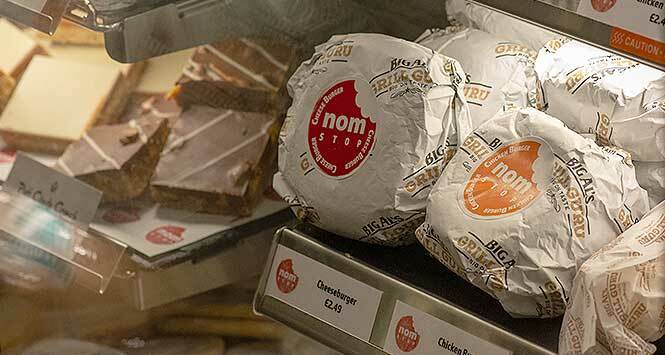 “We feature a wide range of products via Nom Stop to ensure that we’re capturing all the latest food-to-go trends, from breakfast rolls and sausage muffins to soups, mac ‘n’ cheese, burgers and wedges, sandwiches, croques and cake. All the food options have been carefully considered, with essential allergen information and nutritional data provided, as well as POS cards, stickers and posters for retailers to use. Items can be heated in a matter of minutes, available ‘grab and go’ from the hot-hold cabinet. The Nom Stop food-to-go set up can be created bespoke to customers’ needs and Lomond’s team are available to help with any enquiries on 0141 353 6777.